For almost a decade, quantitative NMR spectroscopy (qNMR) has been established as valuable tool in drug analysis. In all disciplines, i. e. drug identification, impurity profiling and assay, qNMR can be utilized. Separation techniques such as high performance liquid chromatography, gas chromatography, super fluid chromatography and capillary electrophoresis techniques, govern the purity evaluation of drugs. However, these techniques are not always able to solve the analytical problems often resulting in insufficient methods. Nevertheless such methods find their way into international pharmacopoeias. 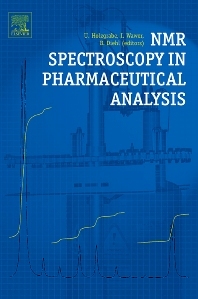 Thus, the aim of the book is to describe the possibilities of qNMR in pharmaceutical analysis. Beside the introduction to the physical fundamentals and techniques the principles of the application in drug analysis are described: quality evaluation of drugs, polymer characterization, natural products and corresponding reference compounds, metabolism, and solid phase NMR spectroscopy for the characterization drug substances, e.g. the water content, polymorphism, and drug formulations, e.g. tablets, powders. This part is accompanied by more special chapters dealing with representative examples. They give more detailed information by means of concrete examples.